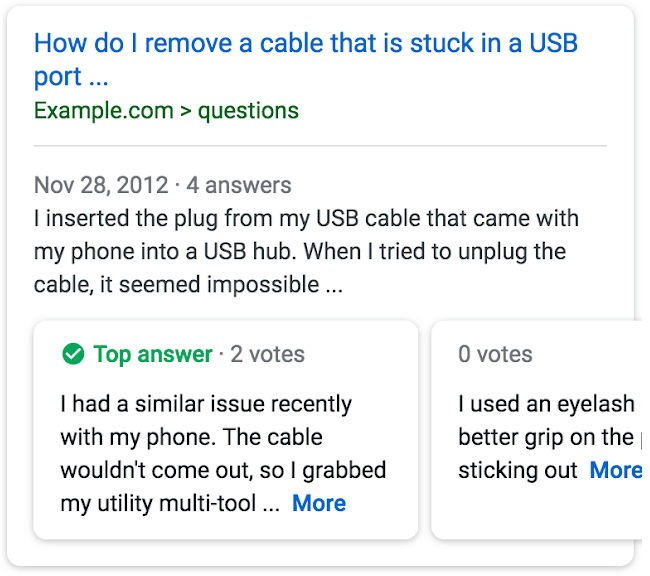 Google has launched new Q&A Rich Results to quickly present users with answers to question based queries. The question and answer results are in addition to other types of rich results on Google such as reviews, recipe cards and knowledge panels. The news was released on the Google Webmaster Blog last week, with the article explaining users visit Google to find answers. The intention of the new structured data is to help users find the answer to their queries faster than ever before. People frequently visit Google to help them answer a question, with 8% of Google search queries being phrased as questions. The new Question and Answer rich result pulls information from places where users ask and answer each other’s questions, such as expert forums and help and support message boards. To be eligible to appear for these search results Q&A structured data markup needs to be on the page. Guidelines state that this should be used when the page content has information in a question and answer formats such as forums or an FAQ page. This marks the latest in a long list of structured data advances after voice search structured data was released in August.